Greta is a Nord citizen of Solitude. 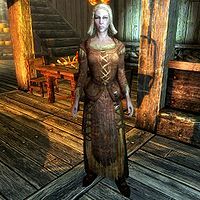 She is the sister of the recently executed Roggvir, as well as the wife of Addvar, and mother of Svari. If Addvar dies, she takes over running his fish stall in Solitude's marketplace. She is a devout worshipper of Talos, and will ask you to retrieve Roggvir's amulet of Talos. Greta wears a set of farm clothes along with a hat and a pair of boots. She wields an iron dagger and carries her key to Addvar's house along with a selection of lower-class items and gold. When she is at Roggvir's execution, she will tell you, "That's my brother up there." She may also say to herself, "Roggvir... Why did it have to be like this?" or "It shouldn't have been like this." Approaching her will have her say things like "I'm not looking for conversation. ", "If you want to talk about my brother, I'm not interested. ", and "I'm in mourning. Can't you see that?" If you end conversation with her, she may tell herself, "I should make sure Svari is okay." or "Addvar won't sell anything if I don't go and check up on him." When she asks you, "Are you here to talk about my brother? Do you think his execution was justified?" You can tell her that you think he was a traitor, though she will respond with anger: "Then you didn't know Roggvir, and you have no idea what it means to be a Nord of Skyrim! He did the honorable thing, even when he knew it would cost him everything. My brother was the best man in Solitude." If you say that no, you think he was a honorable man, she'll reply with "Then like Roggvir, you're a Nord at heart. It's hard for many of the people here to understand. I think Aldis understands. I don't think I could have stayed here if anyone else had..." She'll end by saying, "I... I think I need to stop talking now..."
Alternatively, you can ask her who her brother is and she'll answer, "Roggvir. He opened a gate and they executed him for it. He opened a gate and the wrong man rode out of it. If that man hadn't been Ulfric Stormcloak. If Ulfric hadn't killed High King Torygg... But it was Ulfric. And he did kill the High King, in honorable combat. My brother refused to allow the the [sic] Imperials to take revenge for the deed. So now he's dead." Again, you have two options, either saying that Roggvir was a traitor or that he did what he thought was right, though her response will be the same as above. Svari is worried about her mother, and will ask you to talk to Greta. Upon mentioning this to her, she'll say, "She did, did she? She's going to get a sit down later." You can continue by saying that Svari wants her to return to the Temple, and she'll reply, "Well. I wish it were that simple. Maybe it is. Look, I want to go back but I won't feel right in there without a tie to Talos." She'll go on to explain, "My brother Roggvir wore a symbol of Talos. He kept it hidden on his person. If I had that... I can't go near his body. Would you get it back for me?" Telling her that you'll do what you can. She'll say, "Thanks." Alternatively, if you already have Roggvir's amulet of Talos with you, you can instead tell her that you've actually got it here, and she'll respond, "Why did you... nevermind, it's a sign. I'll return to temple. Here's something for your help." If you bring the amulet to her later, she'll otherwise reply with "Thanks so much. I'll return to temple. Here's something for your time and effort." Either way she will reward you with some leveled gold. Once Greta starts visiting the Temple again, she can be found chanting in prayer, "Let us walk in the steps of the Divines. ", "Remind us of our place, when we forget. ", or "May knowledge of your Divinity carry us through our daily trials." She shares this dialogue with Silana Petreia, Rorlund, and Freir. "I ain't begging. I just need a job. Anything." Jaree-Ra "Shoo! Go away! You get nothing from me." Deeja "You bother me again, maybe you will not walk away. Understand?" East Empire Dockmaster "Sorry, I have everyone I need at the warehouse. Times are tight." Addvar: "We'll make it, Greta. We always have so far..."
Greta: "Maybe we'll have better luck tomorrow." (to Svari) "Eat up, Svari." Svari: "Fish? Again?" OR "Potatoes? Again?" Addvar: "It's all we've got for today. Don't be greedy." Addvar: "Svari, Jala said you stole an apple from her cart yesterday. Is this true?" Svari: "Just a little one! I was hungry!" Greta: "I'll talk with Jala, dear. I'm sure she'll accept a potato as repayment." Addvar: "I suppose. But Svari, we don't steal. We're better than that. Understand?" This page was last modified on 23 October 2014, at 05:24.